The August Smart Lock Pro + Connect lets you lock and unlock your front door, get alerts, and allow guest access all from your phone. The smart lock works with your existing deadbolt lock, so you can use your regular house keys anytime too. Unlock your front door without the need for your keys or smartphone! The August Smart Keypad works with all smart locks offered by August. Just type in your unique code into the keypad door lock to access your home. The August Smart Lock Pro + Connect + Google Home Hub and a free Smart Keypad is the perfect bundle to enter the smart home security landscape, letting you lock and unlock your door, get alerts, and allow guest access all from your phone. The Smart Keypad gives you the option to lock and unlock your door without the need for keys or a smartphone. The added Google Home Hub brings extra smart control, allowing you to take control of your lock with the sound of your voice. The August Smart Lock Pro + Connect + Google Home Hub + free Keypad encompasses smart, efficient, and secure home security. The August Smart Lock Pro + Connect and free Smart Keypad will give you several options to intelligently access and lock your home. The free Smart keypad gives you a great option to unlock your home locally without the need to fumble for your keys or look for your phone. The Google Home Hub couldn't be a better partner for your August Lock Pro but is also an absolute power-house voice assisant that stands alone as an ircedible smart product that can be the center of your smart home. DoorSense technology: August’s DoorSense technology knows when you have left your door unlocked and will immediately notify you by sending an alert to your phone. Manage guest access: You can create virtual guest keys anytime from your smartphone. These allow your friends, family, or Airbnb guests to enter for a designated period of time specified by you. This also includes temporary keypad codes using the Smart Keypad. Activity log: By using the app, you can oversee the August Lock’s activity log to see who has been entering your home throughout the day or week. This will assure you always have a great overview over your humble abode. No Smartphone needed: No need for keys or even your smartphone! The Smart Keypad allows you to unlock your home without fumbling around meaning it's a great backup if you can't find your keys or your phone runs out of battery. Auto-Unlock: The August Smart Lock Pro ­+ Connect detects when you are arriving home or headed out, unlocking and locking your door automatically so you don't have to think about it thus never forgetting about it. All you need to do is have your smartphone on you. Voice control: This August Smart Lock bundle with the added Google Home Hub enables voice control. You'll be able to lock your door and check the status of your August Locks with power of your voice. More smart capabilities with the Google Home Hub:The latest voice-activated assistant from Google comes with a touch-screen display to add a visual aspect to your smart control. It can be the center of your smart home, compatible with 100s of smart brands while also giving you everyday functions like music, traffic updates, and helping with your grocery list. Enter the world of smart home security with the August Smart Lock Pro + Connect + Google Home Hub and free Smart Keypad. This bundle give you a wide range of functions to help you lock and unlock your home efficiently and securely. The August Smart Lock Pro allows you to lock and unlock your door, check alerts, and manage guests access to your home directly from your phone or by using a pass code on the Smart Keypad. 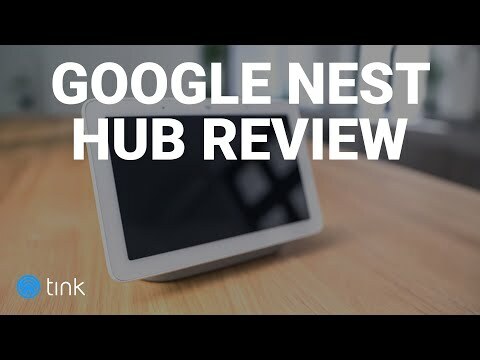 The included Google Home Hub, will enable voice control so you can lock your door and check its status without lifting a finger but is also a powerful home assistant that comes with its own dynamic smart functions. Thanks to the August Lock’s design, you can install it on top of your regular deadbolt lock. This makes set up very simple: Just unscrew the front plate of your lock on the inside of your door and attach the face plate that comes shipped with the August Lock. The August Lock fits over your existing lock via one of the color coded plastic adapters that matches your deadbolt. This means your August Smart Lock pro will be up and running in a few minutes and also allow you to use your standard house keys whenever you want to. You also have the option to use the Smart Keypad and create keys for yourself as well as for friends. The added Google Home Hub enhances your smart capabilities, expanding your smart home options and delivering functions that will make your life easier. Not only does it integrate seamlessly with your August Lock Pro but this voice assistant comes with a 7” display so you get information you can see. Call up directions and physically see them on the LCD display, or make use of video recipes directly on the screen so you can cook with upmost ease. You'll also get a smart speaker for playing your favorite music - stream from popular services like Spotify, TuneIn or Pandora. The lock fits over a standard deadbolt lock, so installation takes only a few minutes. The Keypad comes with a mounting kit which is not too difficult to install yourself. The August smart lock and keypad are both made from high quality, durable materials. Keypad gives good tactile feedback. The August lock offers many features that make accessing your home more convenient, whilst prioritizing security. The added Smart Keypad gives you an additional entry option. The Google Home Hub will help you automate even more. The lock responds to your commands without delay. A modern design that doesn't distract. The Google Home Hub's LCD display is gives off a sleek look. This bundle gives you multiple options for locking and unlocking your home while maintaining the best security possible. The added Google Home Hub and free Smart Keypad are a bonus that will bring great functionality and awesome smart capabilities. Which smart home systems and programs is the August Smart Lock Pro + Connect compatible with? The August Smart Lock Pro + Connect is compatible with Comcast Xfinity, Honeywell Total Connect, Logitech Harmony and POP, Wink Hub, Apple HomeKit, Nest Cam, Nest Learning Thermostat, Airbnb, Homeaway, Google Home, and IFTTT. How do I generate entry codes for the August Smart Keypad? You need to first get within bluetooth range of the smart lock and from here you can generate both temporary and permanent entry codes using the August app. Can I ask the Google Home Hub to unlock my August Smart Lock Pro + Connect? At this time voice assistants can only lock, not unlock, the August Smart Lock Pro.